As your business looks for cost-effective ways to meet customer specifications and increase the bottom line, Sage 300 ERP UAE provides a highly adaptable solution that allows you to expand not only your product line but also the number of locations and services you need to effectively meet customer expectations. With Sage 300 ERP, you’ll keep your costs as low as possible with a comprehensive business management solution that supports multiple technologies, databases, and operating systems to keep your total cost of ownership low. Available in multiple editions, Sage 300 in UAE gives you the opportunity to add users and adopt greater functionality as your business grows and offers built-in support for multiple languages and multicurrency transactions, so your business can comfortably reach around the globe. The superior architecture allows you to grow with the changing size of your business, customize easily to fit special needs and offer flexible deployment options and languages. Ultimate scalability offers extensive customization capabilities and the ability to easily add functionality when you need to. Anytime, anywhere access provides complete access to your accounting system through a standard web browser. Ease to use with intuitive wizards and a familiar interface make configuration and navigation a breeze. Multicurrency and multinational capabilities help you effectively meet the most demanding international requirements. Flexibility to meet the needs of your specific business is provided by a modular, easy-to-expand solution that offers a wide range of high-quality integrated vertical tools and a strong network of more than 400 development partners dedicated to providing you with an end-to-end business management solution. 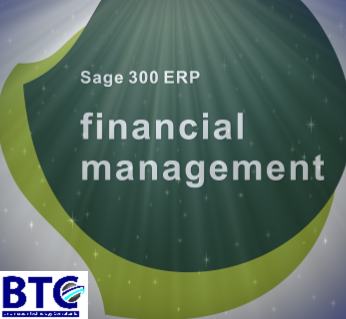 Integrated with your sale and service functions, Sage 300 ERP In Dubai accounting and financial management software gives you the tools for complete end-to-end financial control. General Ledger: The flexible General Ledger allows you to customize your chart of accounts and store up to 99 years of financial information. Accounts Payable: Using a user-friendly interface, Accounts Payable goes beyond recording transactions and financial obligations. Accounts Payable gives you the tools to automate transactions, calculate tax for invoices, manage cash flow and budget forecasts, and get your vendors paid faster. Accounts Receivable: Manage cash flow quickly and easily in the Accounts Receivable module. Its flexible design allows you to view up-to-the-minute data so you can easily track unpaid invoices and stay on top of important customer account information. Checks and Form Printing: 100% guaranteed to be printed error free and to be compatible with your Sage software solution. Multicurrency Manager: No matter what currencies you trade in Multicurrency Manager complies with global standards so that you have the confidence and flexibility to go global. Intercompany Transactions: Automatically distribute transactions across your companies and reduce the amount of work required to record such transactions in your General Ledger and Accounts Payable. G/L Consolidations: The G/L Consolidations module lets you transfer and merge account and transaction information from the separate company and branch locations. System Manager and Bank Book Reconciliation: Quickly and easily reconcile your books with comprehensive bank reconciliation functionality and better track your cash flow for better business decision making. Ask our experts more, about this topic.